This morning, Sony announced some exciting new products for it’s growing line of E Mount equipment! For the serious amateur/hobbyist photographer, the new Sony α6300 is an amazing camera! This flagship APS-C body boasts superior speed, response, and quality in a compact body, with 0.05-s autofocus, 425 phase-detection autofocus points, and 4K Video recording. Englewood Camera just received its first shipment with the brand new, full-frame FE 90mm f2.8 Macro G OSS lens, and our employees put it to the test straightaway! Sony and Zeiss Demo Event Starts Today! Visit Englewood Camera today and tomorrow to play with exciting gear from Sony and Carl Zeiss! We will have Sony tech rep Marc Morris and Zeiss rep Bob Thompson in the store for two fun-filled days. Get your hands on the latest and greatest cameras and lenses, stop by for firmware updates, and get all of your questions answered. It’s going to be a very fun weekend at your favorite camera store! Continue reading Sony and Zeiss Demo Event Starts Today! Posted on December 12, 2014 Author englewoodcameraCategories Digital Photography, New Products, Photography Events, Sales and Promotions, Store News, Upcoming EventsTags Carl Zeiss, Sony Alpha, Sony cameras, Sony FE lenses, Sony full frame, Zeiss Loxia, Zeiss OtusLeave a comment on Sony and Zeiss Demo Event Starts Today! Sony Demo Days This Weekend! Join Englewood Camera and Sony this weekend for a fun-filled demo event at your favorite camera store! Mr. Marc Morris, technical representative and guru for Sony, will be on site during our normal business hours to answer any questions you may have, provide support, and bring merriment to everyone who stops in to say hello! Continue reading Sony Demo Days This Weekend! Posted on December 9, 2014 Author englewoodcameraCategories Digital Photography, Photography Events, Sales and Promotions, Store News, Upcoming EventsTags Marc Morris, Sony Alpha, Sony cameras, Sony demo days, Sony full frame, Sony lenses, Sony mirrorless, Sony sale, Sony's on sale2 Comments on Sony Demo Days This Weekend! Photokina 2014 kicked off in Cologne, Germany this week, and we’d like to make sure all of our customers are aware of the hot new products as they are announced! 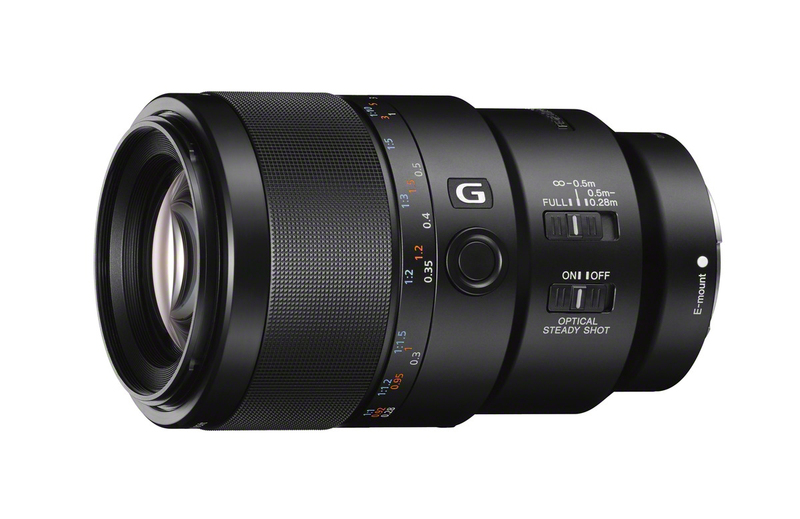 Sony updated their lens roadmap, and it includes 4 new lenses that are currently under development. We do not have an exact ETA as of yet, but we can tell you these lenses should be available early 2015; feel free to call or email us to be added to a wait list! 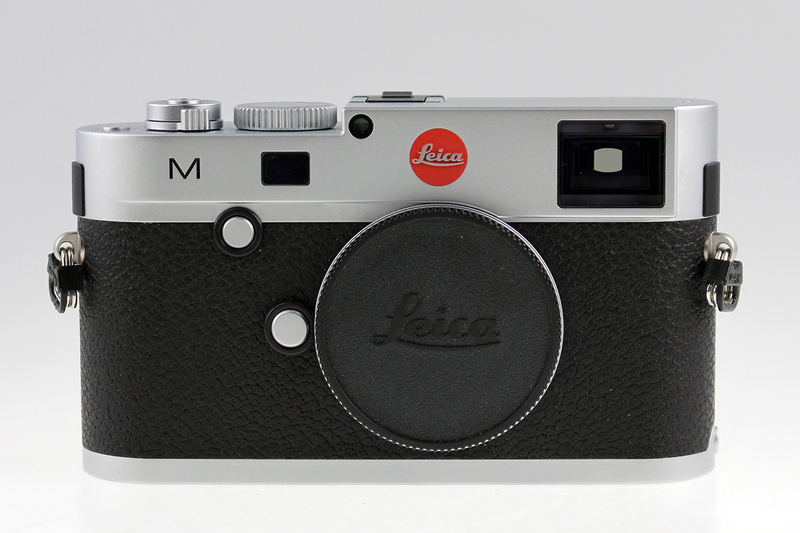 Check out Englewood Camera’s amazing selection of full-frame cameras (and cropped, too!) available this weekend! Don’t forget: we offer fair prices, a 6-month warranty, and equipment you can count on! We have a great selection of Canon and Nikon bodies, as well as other brands–and plenty of lenses too. See images below for a taste of some of the cameras currently on the shelf! 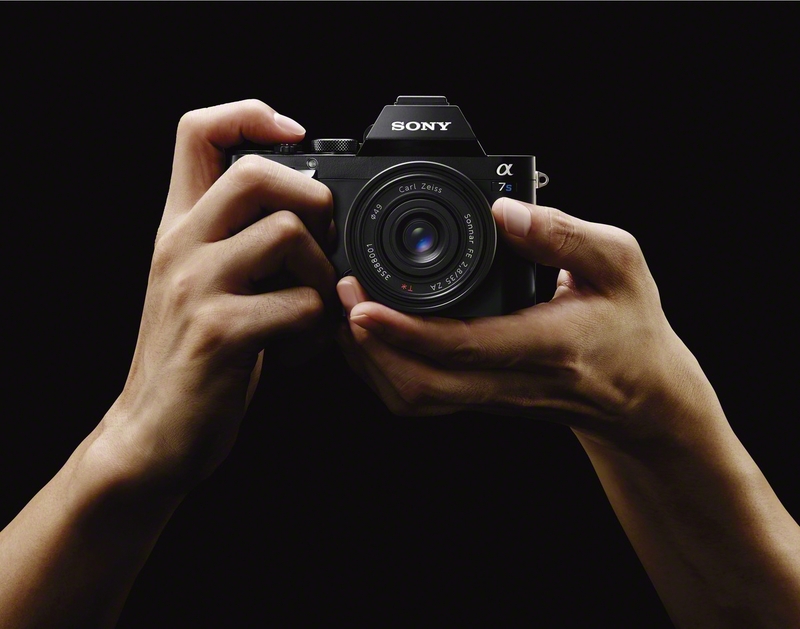 Sony announced a new full frame mirrorless camera to it’s very attractive, very popular Alpha system this weekend. The new α7S is designed for users shooting both video and stills; this innovative camera offers a powerful BIONZ X image processor, allowing it to shoot at a sensitivity range of ISO 50 – 409600 with unprecedented dynamic range and low noise. 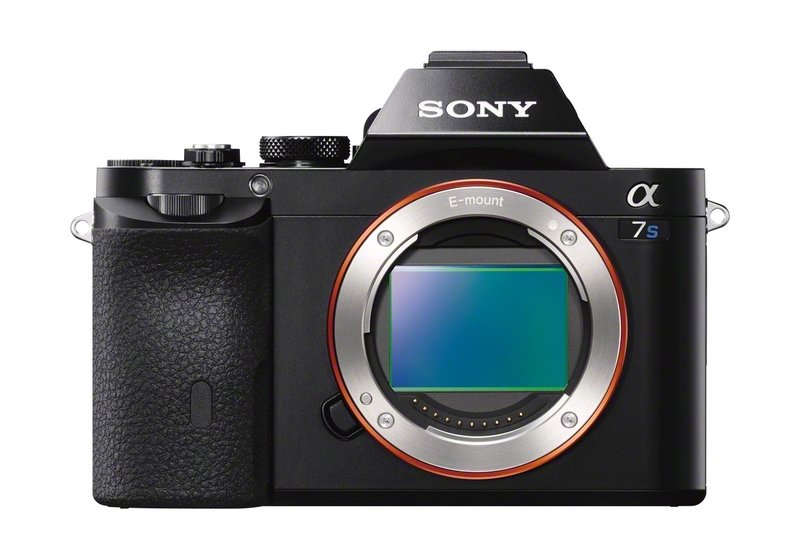 The α7S is the world’s first camera to utilize the entire width of a full-frame image sensor in 4K video acquisition. It does this without cropping or line skipping as it can read and process data from every one of the sensor’s pixels. This allows 4K video shooters to utilize all of the artistic and creative benefits provided by the unique sensor. 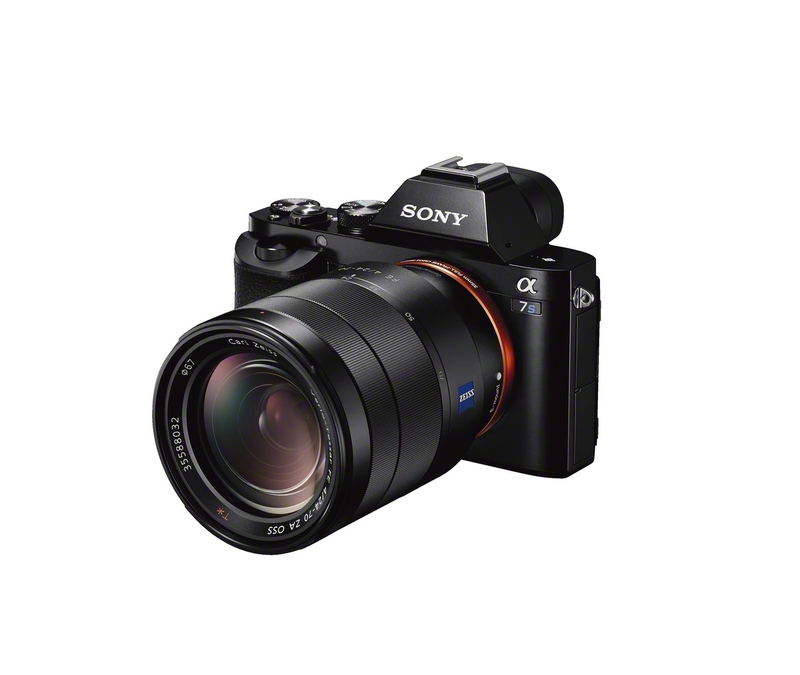 For the first time ever in a Sony α camera, the α7S adopts the workflow-friendly XAVC S recording format in addition to AVCHD and MP4 codecs. XAVC S format allows for full HD recording at a data rate of 50 mbps with lower compression for improved video quality. The α7S can record full HD (1920×1080) at frame rates of 60p, 60i, 30p and 24p directly to a compatible memory card. Video modes can be changed from full-frame to APS-C (super 35mm equivalent) if desired, and in this crop mode, the camera can support high frame rate 120fps shooting at standard HD resolution (1280 x 720p), creating a 5x slow-motion effect. Expected ship date is June 2014: give us a shout if you’d like to be contacted for more information on price and exact delivery as we know it! In the market for a new camera? 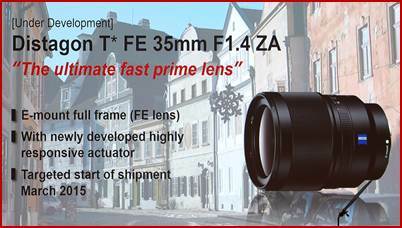 Need additional lenses for your current set up? Check out instant savings this week (2/9/14-2/15/14) from popular brands like Canon, Fuji and Sony. 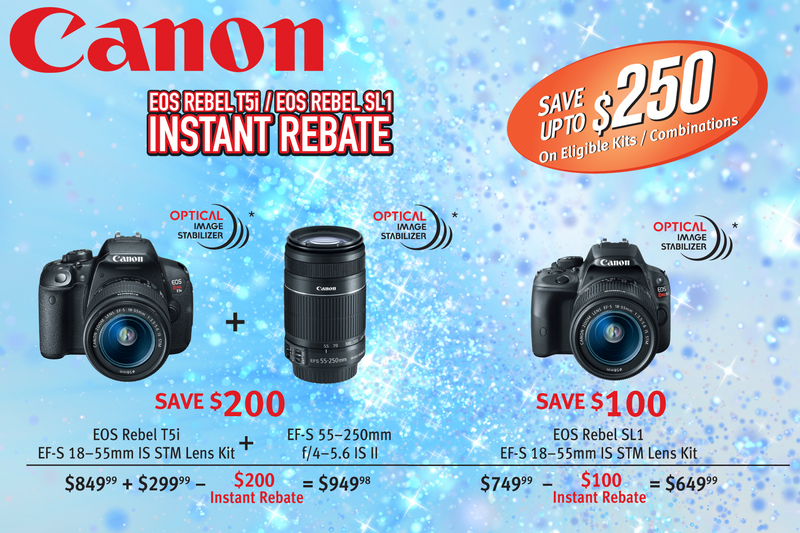 Canon Rebel T5i and SL1: save more when you bundle! 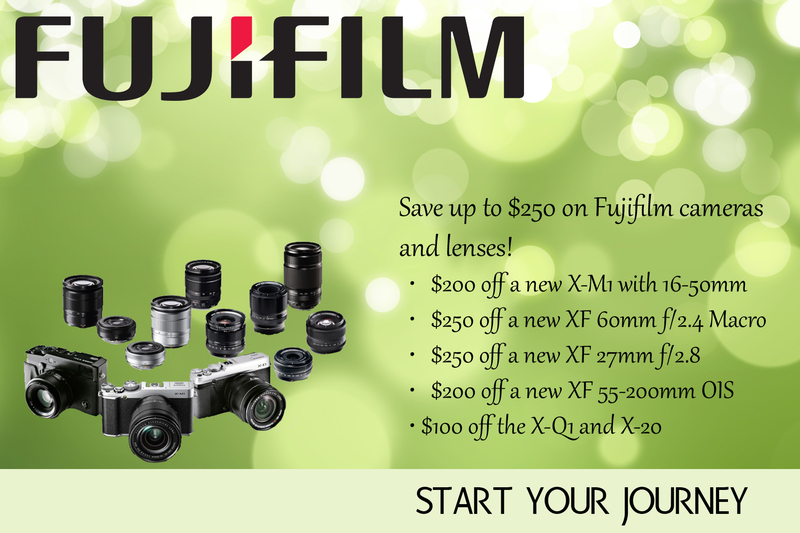 Big savings on Fujifilm X-Series cameras and lenses! 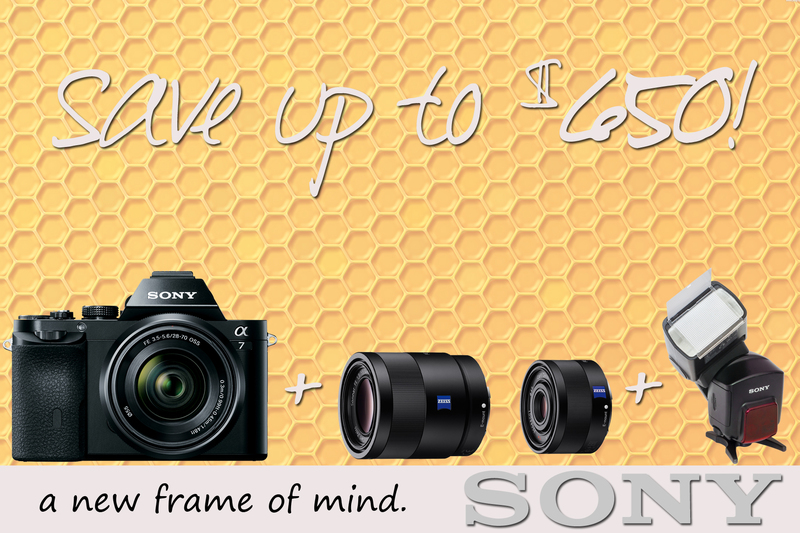 Save $450 when you purchase the Sony A7 with the HVLF-60M! Save more when you add lenses to the mix.